Includes five shades: Feather, Lace, Chinelle, Satin and Velvet. Super-saturated, yet totally wearable shadows with just a touch of lid-lighting shimmer. Apply your darkest colour in a sideways V with Jane Iredale Eye Contour Brush. Highlight above the iris in a medium shade with Jane Iredale Eye Shader Brush. 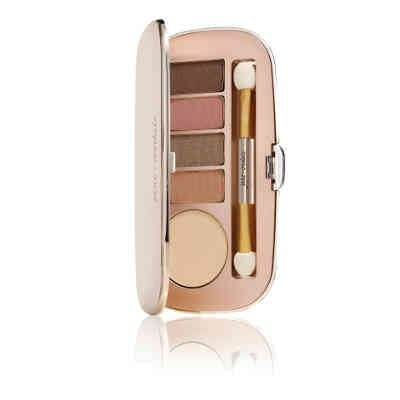 Highlight the brow bone in your lightest shade with Jane Iredale Deluxe Shader Brush. Blend well with a Jane Iredale clean brush. It's always a good idea to brush the Jane Iredale Base Powder on the eye lid to even out the skin tone. Dont try to math the eye colour with a shadow, since this will only cancel out the eye. A complementary/contrasting colour is what makes the ye pop (e.g. brown/blue). Spritz Jane Iredale eye liner brush with Jane Iredale D20, Balance or POMMIST and pick up shadow for an eyeliner that stay. If you have red or dark circles, stay away from blue or grey tones. They just accentuate the darkness.